There are many people who would say they watch their spending on groceries and try to cut costs where they can. But it’s different for Gina Marlow. It’s more than just clipping coupons. It’s something she’s had to memorize, something she’s studied. For example, she knows – off the top of her head – that milk is 20 cents cheaper at Dollar General than at Walmart. She knows when Aldi is having a sale on meat, and she knows exactly how much the price of eggs has risen in the past three months. Gina, 43, who has lived in Margaret Avenue Housing Project apartments since 2010, is not alone in her struggle to feed her family. In January 2017, there were 6,139 Vigo County households who utilized the Supplemental Nutrition Assistance Program (SNAP, commonly referred to as food stamps), according to the most recent data from the Family and Social Services Administration’s Division of Family Resources. That’s a 6.35 percent decrease from the number of households using food stamps in January 2016. In 2015, 22.9 percent of Vigo County children experienced food insecurity, according to the most recent Kids Count data. That’s higher than the state average for child food insecurity, which was 19.1 percent in 2015. Gina knows when the nearest churches have free meals too, just in case she should ever need them. Gina says she learned a lot of coping skills from her mom who raised seven children on her own. preschooler often cried after eating and had an upset stomach, so she began experimenting with her diet, cutting dairy and then gluten—	getting rid of gluten made Tasha feel better. She tries to stick as closely as possible to the $338 per month from SNAP she has to feed her three-person household. That’s a drop from what she used to receive before Tasha was approved for disability assistance for her autism. Indiana actually needs $46,495 a year to afford basic necessities. That gap between the poverty line and what’s needed to afford the local standard of living leaves many local families food insecure, meaning they lack access to sufficient food or don’t know when sufficient food will be available to them. Gina enrolled at Ivy Tech in 2012, attending classes part-time so she can spend more time with her daughters and participate in Tasha’s therapy. Previously, she worked at the former Mike’s Market store on South Third Street in Terre Haute for almost 10 years before it shut down in 2017. Gina is completing a concentration in foreign language as part of her degree. She’d like to teach preschool one day, or work with Spanishspeaking children with autism — a cause she’s passionate about based on her daughter’s experiences. “I have big dreams,” she said. Gina says her daughters have been her motivation to earn a degree and make a better life for them. When the family gets ready to eat, they pull up stools in front of the couch and desk chair in their living room to balance their plates on. The extent of the first floor of their apartment, which can be crossed from front door to back door in about 18 steps, is the kitchen and living room. There’s no room for a dining room table and chairs. 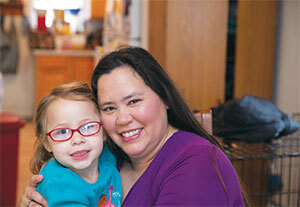 “That’s my dream is to have a house with a kitchen that’s big enough to put a table in there,” Gina said. Normally I don’t try to take on the role of confronting government proposals that attempt to fix something that isn’t broken. However, recently the strategy as to how we ensure families have access to nutrition has come under scrutiny. It is my hope this shift includes a factual and realistic look at the benefits of the current program called the Supplemental Nutrition Assistance Program (SNAP, commonly referred to as food stamps). Almost every day brings new reports that Congress is interested in further whittling away at the programs comprising the social safety net for lowincome households, the disabled and the elderly. The program we are most concerned about is SNAP, a program that helps 692,024 low-income Hoosiers buy essential groceries each month for themselves and their families. SNAP and other nutrition programs are part of the Farm Bill which is up for renewal in 2018. A current budget (at the time of this writing) proposes cutting SNAP benefits by $193 million. Some members of Congress are now seeking to further slash benefits, change the structure and add work requirements to this important program (most SNAP recipients who are able to work, already do). What they may fail to understand however, is that SNAP in its current form is effective and efficient. SNAP provides nutrition assistance for our state’s most vulnerable people. Here in Indiana, SNAP predominantly aids households with children, seniors, and people with disabilities. These benefits pay long-term dividends – in addition to reducing hunger. Those who receive SNAP benefits in early childhood have lower risks of obesity, high blood pressure, heart disease, and diabetes as adults. SNAP benefits the economy. SNAP is associated with higher use of preventive care, which can contribute to lower healthcare costs overall. Furthermore, SNAP pumped $81,682,191 into Indiana’s economy in 2016 alone. 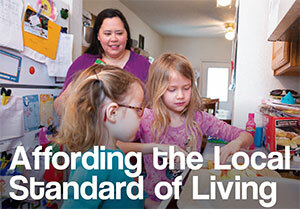 The program is also responsible for helping to lift thousands of Hoosier’s out of poverty. Not only does SNAP work, – for those most in need and for the state’s economy at large – but its current structure allows the program to expand in times of greater need, such as the 2008 recession, and contract in times of economic prosperity. Thousands of households depend on SNAP benefits to help make ends meet. Even in Hamilton County, one of the wealthiest counties in the state, 12.6% of our children are food insecure. SNAP benefits are essential for helping our children face each day ready to thrive. Families and individuals need SNAP to meet basic nutritional needs. It is our time to let Washington DC know that feeding the most vulnerable in our communities is vital to our future and that it is not acceptable for children and senior citizens to be left hungry. Please urge your Congressional representative to protect SNAP in its current form. Soup Bowl Benefit 2018 is in the books and it was a great success - thanks to you! Attendees sampled two dozen soups, assorted breads and desserts from handmade bowls crafted by dozens of area artists while listening to performing musical artists inside Maryland Community Church. The event was a near sell-out, and over $19,000 was raised to benefit Terre Haute Catholic Charities Foodbank. A recent study finds approximately 41,000 individuals - or one in six Hoosiers - living within our service area are food insecure, meaning they have difficulty meeting basic food needs. As a result of your generosity, as many as 76,700 meals can be provided by the Foodbank and its 90+ member agencies throughout Clay, Greene, Knox, Parke, Sullivan, Vermillion and Vigo counties. This event enables us to continue the mission of serving more who struggle to provide for themselves in our communities. Just as Terre Haute Catholic Charities Foodbank depends on volunteers to help feed the hungry all year, the Soup Bowl Benefit relies on a community of volunteers to make this event successful. 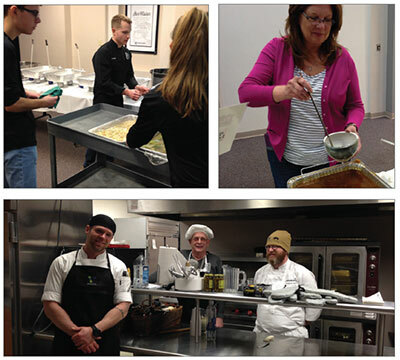 In addition to the planning committee, dozens volunteered their time to help set up, clean up and serve soup. Our appreciation goes out to the Soup Bowl Benefit volunteers, donors, sponsors and attendees for making this year’s event a huge success! 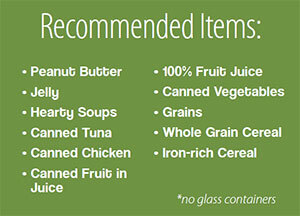 Fill a bag with non-perishable food and leave it by your mailbox by 9:00am on Saturday, May 12. Your letter carrier and Terre Haute Catholic Charities Foodbank will make sure it gets to people in need in our communities.